METROPARADISE explores the value of art and its integration with the built environment to tell the narrative of space/place. As may be seen through the underlying infrastructure of its neglected buildings, there is great potential in the aesthetics of downtown Kingston, Jamaica. Focusing on its strengths, this project envisions the city as an area that is welcoming and is a visual representation of local culture and landscape. Considering present plans for the re-development of downtown Kingston, this concept not only acknowledges physical needs, but tells the story of Kingston through changes in its architecture. The project is a visual narrative of the city’s history prior to the devastating1907 earthquake which destroyed many of the city’s landmark buildings, current state, and a vision for the future based on good design principles. Tiana Anglin, Metroparadise (Transitional Installation view), 2018, Emulsion paints on plywood panels. DECONSTRUCTION, which begins with four (4) significant icons of Kingston’s heyday as Jamaica’s administrative captial during the pre-1907 Earthquake period. These are Religion, Politics, the Arts and Commerce, which are each symbolized by a different object of the time. They are followed by the dilapidated state of what exists on their footprints today, in many sections of Kingston. Tiana Anglin, Kingston Parish Church (Pre-1907), 2018, Emulsion paints on plywood panel. 8’ x 4’. Tiana Anglin, Hibbert Headquarters (Pre-1907), 2018, Emulsion paints on plywood panel. 8’ x 4’. Tiana Anglin, from left Kingston Parish Church, Hibbert House, The Theatre Royal and Kingston Harbour (Pre-1907), 2018, Emulsion paints on plywood panel. 8’ x 4’ each. 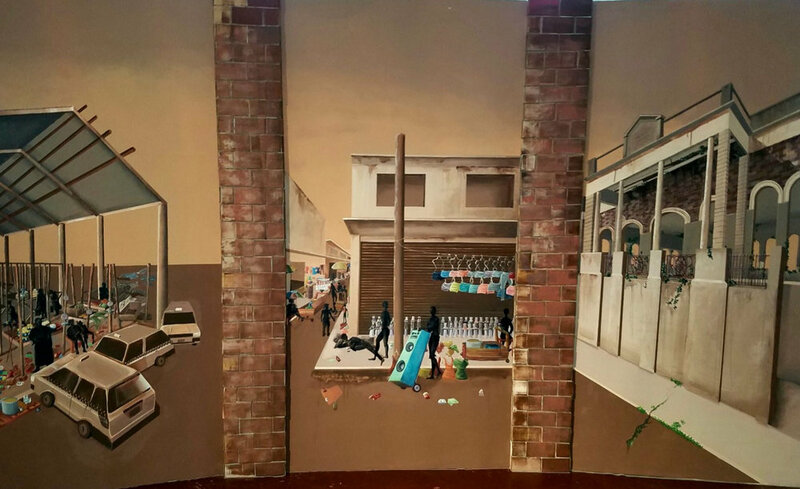 Tiana Anglin, Sections of Kingston, Jamaica today (from the left Neglect, Chaos and Disorder), 2018, Emulsion paints on plywood panel. 8’ x 4’ each. RECONSTRUCTION, further divided into syncretic illustrations showing a concept for Kingston’s future. Tiana Anglin, from the left Kingston Parish Chapel, New House of Parliament, Ward Theatre/Corronation market, and the Kingston Waterfront, 2018, Emulsion paints on plywood panel. 8’ x 4’ each.